The MFD Special Operations Division operates as the “specialized rescue” component of the department. The division includes seven teams, each with specialized training and equipment that allows them to effectively manage emergent situations within their respective field of expertise. The division is led by a Deputy Chief who oversees the ten directors and twenty assistant directors who supervise the teams. In total, this division is comprised of over 350 sworn fire personnel, each of whom engage in countless hours of specialized training to remain well-equipped to meet the dynamic hazards and challenges associated with specialized rescues. This specialized training is in addition to the hours spent performing their customary firefighting and emergency medical service duties. Beyond specialized crisis rescues, the Special Operations Division also provides emergency event planning and standby services for many of its public and private partners. The division plays an integral role in providing citizens with the highest level of public safety during Milwaukee’s busy festival season, and during the numerous social events that occur along the lakefront each year. The Deputy Chief of Special Operations plays an important role in creating and fostering relationships between local, state, and federal officials. This collaboration between the agencies ensures that open lines of communication exist so that homeland security issues can be quickly identified and resolved. Not surprising, preparing emergency support for dignitary visits falls under the jurisdiction of this division as well. The MFD Dive Rescue Team was founded in 1961 by a group of dedicated firefighters who volunteered to go through a Navy training program after they recognized the need for water rescue capabilities. The team is stationed at Fire Station 2 and consists of 46 dedicated members that train monthly to maintain their skills in a multitude of disciplines. Those disciplines include, but are not limited to, deep diving, night diving, river rescue, swift water rescue, submerged auto rescue, thin ice rescue, and ice diving. The recent revitalization of Milwaukee’s downtown and Third Ward areas have increased the need for this team, which averages more than 40 dive calls per year. Population in these areas have increased, as have the number of planned events held in these areas. The Dive Team stands by and provides protection at events throughout the year, including the Polar Plunge on New Year’s Day, a Polar Plunge for Special Olympics, the Air and Water Show, and the Triathlon. Additionally, the Dive Team is prepared for water-related emergencies at summer festivals at Henry Maier Festival Park, Milwaukee’s beaches, or in one of Milwaukee’s busy river ways. On Lake Michigan, the Dive Team works in concert with the MFD Boat Team, Milwaukee Police Department Dive Team, and the US Coast Guard. The MFD Boat Team has been proudly and dutifully serving the citizens of, and visitors to, the City of Milwaukee for over 120 years. They provide fire, EMS, and rescue services for the many waterways, shorelines, and off-shore areas extending 40 nautical miles east into Lake Michigan. The MFD Boat Team is the oldest of all the specialized teams; existing since delivery of the first boat in 1889. The current fireboat, the Trident, is the 11th edition in a long line of capable vessels. The Trident is a model of technology with twin 570 hp Cummins diesel engines supplying power to jet propelled drives capable of pushing the 39 foot Metalcraft Marine Boat over 35knots. It has the capability of flowing 3400gpm for fighting nearshore or offshore fires, can transport up to three critically injured victims with advanced life support care, and can perform offshore search and rescue with state of the art radar, forward-looking infrared cameras, radio direction finder, and sonar searches beneath the water’s surface. Team members train diligently to remain proficient and ready to respond to any incident in all types of weather. They spend over 100 hours per year on and off the water keeping skills sharp to provide the best possible service. Many of members possess nationally recognized certifications in search and rescue boat operations, and the team continues to strive to gain more knowledge and experience every year. In recent years, the team has worked more closely within the MFD Marine Division which comprises the Boat and Dive Teams; there is continual cross-training to provide support for diving operations with the 17’ Zodiac inflatable boat. This craft is utilized extensively allowing the divers to focus on the extremely dangerous job they must do. They annually train with partners, the Milwaukee Police Department Boat Team, the Wisconsin Department of Natural Resources, and the United States Coast Guard. These inter-agency trainings prepare all entities to function efficiently and seamlessly should the need arise during a major incident on the waterways. The MFD Boat Team is an important part of the service the City of Milwaukee is obligated to provide for its citizens. The City of Milwaukee is fortunate to have such beautiful natural resources as lakes and rivers, and the people utilizing these natural resources can rest safely knowing the well-trained and equipped men and women of the MFD Boat Team are there should they be needed. 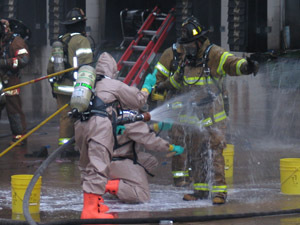 The MFD Hazardous Materials (HazMat) Team began in 1982 as a remedy to small-scale fuel spills and other similar situations. Today the team is 80 members strong, and the team headquarters is located at 4515 West Burnham Street which is home to Engine 33, Truck 16, HazMat 1 and HazMat 2. As the world changes, so too has the HazMat Team. Along with the typical fuel spills, household chemical mishaps, and industrial chemical leaks, the team specializes in weapons of mass destruction, illicit labs, terror threats, and radiological events. As one of only two Tier 1 Teams in the state, the team is tasked with responding to high-profile situations anywhere in the southern half of Wisconsin. Along with responding in person to events, team members serve in an advisory role via telephone for ongoing hazmat events which allows MFD physical assets to remain available for other situations. The team has ongoing relationships with entities such as the FBI, Drug Enforcement Administration, Homeland Security, State Lab of Hygiene, Civil Support Team, Wisconsin Emergency Management, and the City of Milwaukee Health Department. In addition to all of the members being hazmat technicians, many have served on both the state and national levels in terms of instructing and/or presenting on various topics relating to hazardous materials response. The MFD Heavy Urban Rescue Team (HURT) was established in 1995 as a consolidation of the Rope Rescue Team and the Deep Tunnel Team. Since this merger, the HURT’s capabilities have grown to include confined space rescue, trench rescue, structural collapse rescue, high and low angle rope rescue, advanced auto extrication, heavy vehicle lifting and stabilization, man-in-machine rescue, firefighter survival, and others. The HURT also handled deep tunnel rescue for several years in the early 2000’s. The HURT was originally housed at Station 12 located at 1400 South 9th Street on Milwaukee’s near south side. The HURT has improved its compliment of rigs and equipment each year to meet the technical rescue needs of the City of Milwaukee and its shared services partners. Two fully staffed heavy rescue companies were established in January of 2012. The addition of the rescue units resulted in the team being split into two separate station houses. Rescue 1 is housed at 1400 South 9th Street along with Engine 23 and Rescue 4 (trench and structural collapse rescue rig), and Rescue 2 is housed at 4927 West Fiebrantz Avenue along with Engine 24. These two locations provide the city with enhanced technical rescue coverage as well as additional training opportunities. The HURT has partnered with several public and private organizations to gain realistic training and experience in a variety of rescue situations. The MFD Incident Command Post Team was officially founded as an MFD special team on January 1, 2012. Crews respond with a state-of-the-art communications R/V that has internet, phone, fax, lighting, and recording capabilities. The team is currently stationed at the quarters of Engine 12 and Truck 1, located at 2130 West Oklahoma Avenue. The team consists of 42 members who specialize in providing support to the command staff at major incidents, improving the safety of the public as well as department members. Examples of responding incident types include third alarm and above fires, high-rise fires, hazardous materials incidents, and active shooter situations. This team is available to surrounding communities through the shared services initiative. The team also stages as large events around the city such as 3rd of July Fireworks, Lakefront Marathon, Rock ‘n Sole, and ALS Run. The Incident Command Post Team incorporates unmanned aerial system (UAS/drone) technology at incidents which provides a high resolution view of the whole scene. Thermal imaging capabilities are attached to the drone which helps to locate hotspots in a building fire, as well as aide in search and rescue of missing persons. MFD Tactical Emergency Medical Services (TEMS) was implemented in 2005 as a way to incorporate instantaneous emergency medical services with scheduled or emergent tactical situations involving local law enforcement. The mission of the TEMS Team, who are paramedic firefighters, is to stand by at a safe distance until law enforcement officials deem the scenes of active shooters, hostage/barricaded subjects, or high risk warrant services safe for medical first responders to move in. Having TEMS already on scene for these events, in which every second counts, is essential to rendering medical services quickly to law enforcement officials, suspects, and even bystanders. In addition to working and training with the Milwaukee Police Department, MFD TEMS has trained with the Milwaukee County Sheriff’s office, and the State of Wisconsin Department of Corrections. The Milwaukee Fire Investigation Unit (FIU), founded in 2009, is a branch of the Special Operations Division. The FIU has 43 members, all of which are assigned to the firefighting work shift. The primary function of the FIU is cause determination of fires. Working with multiple agencies such as the Milwaukee Police Department, the Federal Bureau of Alcohol, Tobacco, and Firearms, and the State Fire Marshal, determinations of how fires started are achieved, and then if criminal charges need to be perused, the FIU works with state and federal prosecutors to educate and support criminal charges. If you would like to anonymously report an arson fire tip, please call the Wisconsin Arson Insurance Council (WAIC) Wisconsin Arson Hotline at 800-362-3005. If your tip leads to an arrest/conviction of an arsonist, you are eligible for a cash reward. WAIC has awarded over $43,000 to tipsters. To learn more, please visit their Web site.